Drag Chain Conveyors consist of a series of metal or plastic flights attached at uniform intervals to one or two strands of endless chain. The chain moves the flights along in a trough thereby pushing or sliding the material along. Carry run is on the bottom side. Multiple inlets and discharge points can be provided with Drag Chain Conveyors, allowing for maximum efficiency. The intermediate discharge openings can be fitted with remote controlled shut-off gate valves to choose the receiving silo. In case of handling abrasive materials, drag conveyor has to be operated at very low speeds. Appropriate chain speed and chain width are vital for the service life of the drag chain conveyor. Drag Chain Conveyors manufactured by AEGIS come with generous design and rugged construction and can be used various applications across various industries. 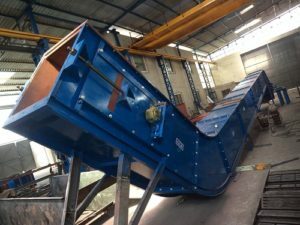 AEGIS designs, manufactures and supplies Drag Chain Conveyors to suit the property of bulk material handled number of operating hours and other surrounding conditions. Can carrying abrasive, moderately abrasive and non-abrasive items. Designed to pull materials like briquettes, agro fuels, coal, woodchips, lime, etc.